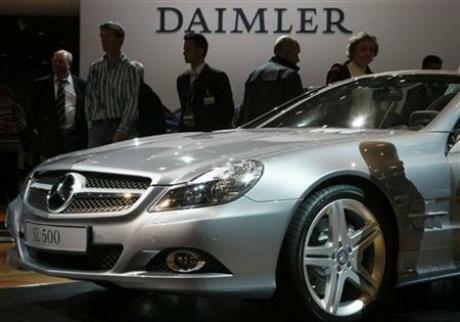 WASHINGTON (Reuters) - Daimler AG's $185 million settlement of allegations the luxury car and truck maker violated U.S. anti-bribery laws by showering foreign government officials with money and gifts to win contracts was approved by a federal judge on Thursday. Daimler's German and Russian units each agreed to plead guilty to two counts of violating U.S. anti-bribery laws. Its China subsidiary will be subject to the two-year deferred prosecution agreement as well. Former FBI Director Louis Freeh will serve as the independent monitor to oversee Daimler's compliance with anti-bribery laws. U.S. District Judge Richard Leon approved the plea agreement and settlement, calling it a "just resolution" and said that the company was taking the right steps to solve the problems of the past. "Using offshore bank accounts, third-party agents and deceptive pricing practices, these companies saw foreign bribery as a way of doing business," said Mythili Raman, a principal deputy in the Justice Department's criminal division. The alleged bribes also took the form of luxury European vacations, armored Mercedes vehicles for high-ranking government officials and a birthday gift to a senior Turkmenistan official including a golden box and 10,000 copies of the official's personal manifesto translated into German. Further, Daimler was accused of violating the terms of the United Nations' Oil for Food Program with Iraq by including kickbacks 10 percent of the contract values to the Iraqi government. The SEC said the company earned more than $4 million from the sale of vehicles and spare parts. "We have learned a lot from past experience," Dieter Zetsche, chairman of Daimler's board, said in a statement. "Today, we are a better and stronger company, and we will continue to do everything we can to maintain the highest compliance standards." Bazzetta alleged that he learned in a July 2001 corporate audit executive committee meeting in Stuttgart that business units "continued to maintain secret bank accounts to bribe foreign government officials," though the company know the practice violated U.S. laws. With acknowledgements to Jeremy Pelofsky and Reuters. These settlements are just money. The aggregate gross profits are so huge that they easily cover the risk and the magnitude of the fines. There need to be some civil claims from competitors and other losing parties amounting to billions of euros that will bring these corrupt companies like BAE Systems, Daimler, MAN Ferrostaal, Thyssen and Siemens to their financial knees. The problem is that these corrupt companies have suh deep pockets that an op;posing litigant just does not have the financial legs to sustain the litigation. Even the UK's SFO was over-awed in taking on BAE Systems in a clutch of corruption cases that are so clear and so winnable that it brings up vomit. In the case of BAE's corruption case in the SA Arms Deal, the SFO became too fearful to even talk about it, let alone pursue it. So they dropped it without even bringing it into the in any case pathetic settlement arrangement. I think I'm going to trade in my English and Scottish genes.